Are you going to travel to Rome, it is always nice to know a little about the history of Rome. To tell the whole history of ROme on one page is impossible (if it is not going to be ridiculously long). Currently I have confined myself to list the most important years of the Roman history. Later, I will expanding the story of Rome, but this is good enough for now. 509 BC Rome was declared as arepublic after the fall of the seventh Etruscan king Tarquinius Superbus. 101 BC is the first battle with the Germans, Cimberi and Teutons was defeated. 71 BC Spartacus leads the gladiators to a civil war and it ends with a bloodbath where he was defeated. 60 BC Caesar, Crassus and Pompei controls the City of Rome in the first so-called three-man Empire. 44 BC Caesar is assassinated. 64 The first persecution of Christians under the emperor Nero..
330 Constantinople becomes capital of the empire. 452 Pope Leo the Great prevented Attila from conquering Rome. 1300s The christian papacy reach its peak. 1527 German and Spanish merchants sacking Rome for several months and around 30,000 people dies. 1572 Gregory XIII restore the old water system and the popularity is a fact. 1870 Rome became the capital city of Italy. 1922 Fascists march into Rome. Mussolini becomes dictator. 1944 Allied troops marchesg into Rome. 1957 Rome treaty signed and a united Europe is founded. 1994 The alliance between the Christian Democrats and the Socialists is defated by "clean hands" (Mani pulite in italian) operation. 2000 Rome celebrates the start of the third millennium of Christianity. The God Mars abandoned his newborn twin sons, Romulus and Remus. They were saved from starving to death by a wolf who let them nurse (see picture above). A poor shepherd and his wife then found the children and took care of them. When the brothers grew up, they used a sacred plow and plowed up the boundaries of the city of Rome. Unfortunately, they come to a disaggrement, and it ended with Romulus killing Remus. 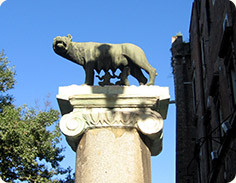 Romulus then named the city to Rome after himself. According to legend, this would have been exactly 21 April 753 years before Christ. Curiously, archeological excavations in Palatino shows that year actually can be correct. Palatino (or Palatine Hill) is one of Rome's seven hills and it was here that Rome "Romea Quadrata" once was founded. To boost growth in Rome will Romulus also (according to the legend) invited a	neighboring people, the Sabines, at a party. During the night he robbed the Sabine women away so the roman men would have someone to breed with.